I love making desserts, especially around the holidays. One of my favorite holiday flavors is pumpkin! There’s something about pumpkin that is both comforting and delicious. From pumpkin lattes at Starbucks to pumpkin pie at Thanksgiving, I’m always willing to try something pumpkin and so is my family. For Thanksgiving this year, my boyfriend, Dominick, wanted a Chocolate French Silk Pie. My mother wanted a cheesecake. I wanted the traditional pumpkin pie. It was up to me to find a way to combine all of the family’s preferences into one dessert option. This is how I came up with Pumpkin Cheese-Silk Pie. Needless to say, it was such a hit, by the time I went to take a picture of the pie, it was already gone. I am definitely planning to make another in the near future, so I will make sure to snap a few pictures then. This is definitely a seasonal recipe, since some of the ingredients will only be available around the holidays. Begin by beating softened cream cheese, pumpkin, sugar, brown sugar, and pumpkin pie spice with electric mixer on medium speed until well blended. Gently stir in 1-1/2 cups of the whipped topping. Spoon cream cheese mixture into crust 1/3 of the way full and refrigerate for 2-3 hours. Prepare Pumpkin Spice Pudding according to pudding pie directions on the box. Mix pudding with white milk and beat with whisk for two minutes or until thick. Spoon the pudding mixture into pie crust on top of the cheesecake layer. Make sure to leave room for the final layer of whipped topping that will complete the pie. Refrigerate for 1-2 hours. Spoon on the whipped topping until the pie is full. 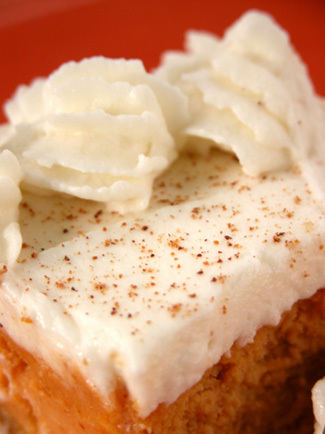 For a little extra flavor sprinkle cinnamon, nutmeg, or pumpkin pie spice onto whipped cream. Note: To lessen the calories you could substitute the whole milk with 1% (this is what I used, but either should work fine) and use Cool Whip Lite.